I couldn't sleep tonight so I decided to search Twitter at little before crashing. I saw the Cardinals were in a tough spot with the bases loaded and no out in the eighth, so I wondered who screwed up. Turns out it was Steve Cishek, one of the new additions from a trade with the Marlins, who walked 3 straight before Seth Maness got St. Louis out of the jam. For some reason I was curious to know more about Cishek, who has had ups and downs in his baseball career. 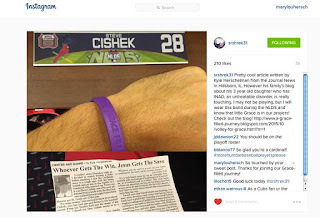 From his Twitter feed and the magic of the interwebs, I found out that Cishek seems to be a pretty good dude. His posts are generally positive, often family oriented and at times uplifting. He has a wife and a daughter, oddly enough named Emmie Grace, which made me think of my Grace. A self described follower of Christ, Cishek also keeps a bible verse in his back pocket when he pitches. Colossians 3:23 "Whatever you do, work at it with all your heart, as working for the Lord, not for human masters"
It's a well timed verse for me as I struggle occassionally with my feelings of inadequacy as a journalist, as a husband and as a father. This verse helps refocus my attention. As long as I'm doing what God wants me to do and living my life the way I should, I don't have to worry about anyone else's expectations, including my own. This is a photo Steve Cishek posted wearing the gracelet we sent him. I'm not sure why Cishek's faith was inspiring tonight, I've seen other devotions and verses that haven't hit as hard, but I'm glad it did. Tonight was one of Cishek's toughest outings as a Cardinal but it seems that he will continue in his faith in this less than ideal situation, something that Grace and her battle with INAD has taught me over and over again. Ultimately, walking three players in an inning won't buy you a lot of fans, but tonight it did. Regardless of where his baseball career takes him, I will be a fan of Steve Cishek, not just the baseball player, but the person.